I have a long-standing love affair with Tocca. I honestly think the brand can do no wrong! 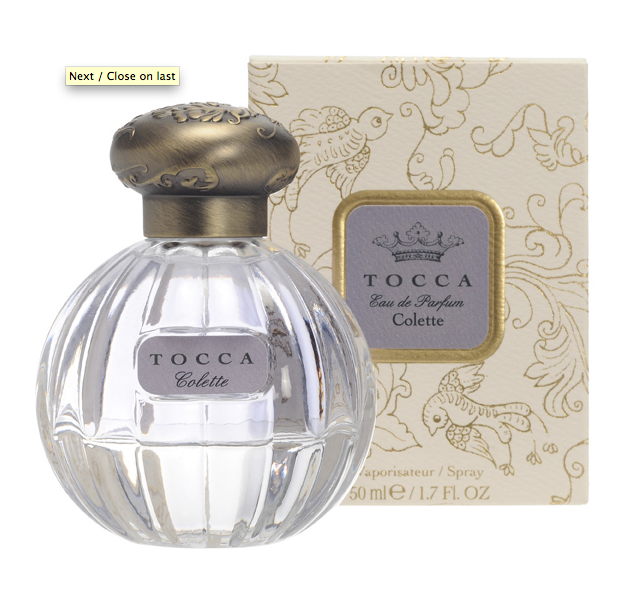 And such is the case with Tocca Colette Eau de Parfum -- a beautiful blend of bergamot, mandarin, lemon, juniper berry, pink peppercorn, jasmine, violet, cyclamen, incense, musk, sandalwood, amber, vanilla and cedarwood. And today, one winner has the chance to win a bottle of Tocca Colette Eau de Parfum, valued at $68! To enter, leave a comment with your name and email address. Get an extra entry for following me on Twitter and tweeting: Hey @BeautyChick101, I want to win Tocca Colette Eau de Parfum! This giveaway is open to US residents only. Giveaway runs until Sunday, August 7 at midnight. The winner will be selected on Monday, August 8 and notified by email. One entry per person, email address and IP address. Multiple entries will be disqualified. I love the Tocca bottle, especially the embossed cap. Awesome giveaway! I love Tocca products. I would love to win this, Its one of the scents I have been wanting to add to my collection! Thanks for holding this Giveaway! You're awesome! I would really like to win this fragrance, I smelled it before and it smells just like my grandma use to. I wish I had the funds to buy it myself but it's hard times and I am unemployed. This fragrance would bring back a lot of memories. I can only hope I win. Yowza, I can't even fathom what that interesting combination would smell like. What a wonderful giveaway. Love The Tocca Colette scent. Thanks so much. I totally hope I win - this sounds like a perfume I'd love! I am all about good smelling perfume & Tocca sounds delightful! I love Tocca products. Great scents. Fabulous all the way. What an incredible sounding blend in this perfume, and honestly, I would expect nothing less from Tocca. Thanks for the chance to win! I've smelled this one at Sephora before, and it's just to die for! (Plus that packaging...so cute!) Count me in. I love the Tocca bottle! I love Tocca! Great giveaway. Thanks so much for the chance at the giveaway. I follow you on twitter as @AFTolar and I tweeted. I'd love to try this scent. Thanks for the giveaway. the bottle on this is beautiful! I've never tried Tocca perfume but have used some other products and they are top notch. Would love to try this perfume! The description sounds wonderful! I'd love to try this. Thanks! I would love to try this perfume. This sounds wonderful. I'd love to try this perfume. Fingers crossed! I would so love to win this! Wow! What a giveaway! I would love to win this! I love the way you described the scent- would love to try! I love the notes in this perfume! I've sampled this fragrance at Sephora and it's fabulous. Elaina giffin I would love to win this ! Great giveaway. I would love to try this perfume, thanks for the chance! Tocca Cleopatra body cream is dreamy. I'd love to try Colette! I love perfume and trying new scents. Please enter me into the giveaway. I would love to win this. The bottle itself is lovely and I imagine the perfume itself is divine. Beautiful bottle, thanks for the giveaway. Christine: christine at envail dot com. Beautiful product, I love it! I would love to win this! I love Tocca products! I love Tocca! Thanks for the giveaway! I have never heard of this brand before. The bottle is gorgeous. What a pretty bottle. I bet this smells heavenly! Would love to own this perfume. Smells great! I'm desperate for perfume! I ran out months ago and can't afford to buy any! I love the name of this perfume and it smells divine. I would love to leave this on the pillows. I need new perfume, this looks great! I've been wearing the same perfume for the past 20 years. After reading this wonderful write up, maybe it's time I start thinking about trying another fragrance and this one seems like the perfect one to try. Thank you for the opportunity to possibly win this generous prize and good luck to all. Great contest!! I would love to win this perfume.